Cleareance of exhibition rooms begins 15 minutes before closing time. 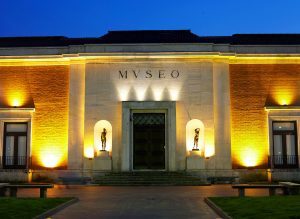 The Fine Arts Museum of Bilbao is divided into four main sections: ancient art, contemporary art, Basque art and applied arts. The collection allows visitors to examine an extensive range of plastic arts dating from the 12th century to the present day. In addition to the fifteen to twenty temporary exhibitions held every year on ancient and contemporary art, photographs, engravings and architecture, film seasons are arranged on a daily basis on different directors, artists and schools. The Museum also offers a number of additional services to the public such as the library, bookstore, educational department, prints and engravings department and cafeteria. The Fine Arts Museum of Bilbao offers visitors a unique opportunity to explore the world of art.